REsheets is proud to offer the never before heard of: $100 Financial Analysis. Let that sink in, and then remember your first try is free. It’s part of a whole new movement here at REsheets, and the internet everywhere, to modernize access to information, and to keep your arms and legs in the process. So it’s your choice, a $100 complete Discounted Cash Flow analysis, or a $100 Standard Analysis with Scenario Specifics. The details are here, but mostly your property will determine the more appropriate analysis, and we’re here to help make it simple. All analysis is performed through REsheets Brand Analysis Models. That’s it! 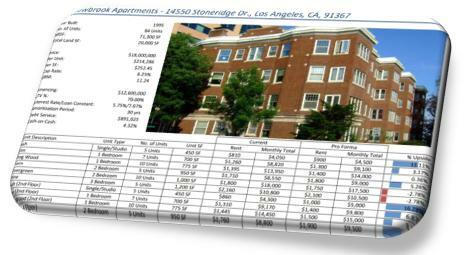 Rifle through your desk (or desktop), upturn a dormant commercial property, and get it valued. Send an email through our Contact Page to get started. Wasn’t that easy? Where’s the catch? An Argus DCF valuation runs $1,000 at minimum. How do we get away with this? And if you haven’t heard it enough recently, it’s all because of our devotion to that one word: elegance. Say it as simply as possible, but never simpler. We’ve produced the most efficient analysis software to dissect the meat of a commercial property, its real value, nothing less, and nothing more. We’re efficient, practiced, and expect you back again and again, from your first analysis, through all your properties, because now there’s no need to overspend on information, and the very real return on proper analysis is much easier to swallow. Get 10 properties analyzed for the price you’d generally spend on one, 10 prepared properties to face the market instead of one, and when you sell that one, it’s worth it 100 times over. Give REsheets’ services a shot, Contact us here with “financial analysis” in the message box.